Website and processes: 26 Nov 16 Tracy Mustoe, 5/5 Excellent "Nice and easy to use, no problems encountered. We have used Flights4all before and the whole experience was excellent from start to finish." Flying is not just about piloting an aircraft well - Navigation and Observation are two equally important parts. This helicopter lesson allows you to experience these 3 aspects to send you on your way to becoming a helicopter pilot! 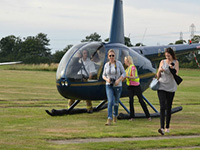 Your lesson is preceded by a short flight briefing with our instructor who will explain all aspects of the flight including the effects of controls and how a helicopter flies. You will then be allowed to take the controls and actually fly the aircraft! Spend up to 20 minutes in the air, both as a pilot and a passenger, split between three separate flights. You will be flying in a 4-seat helicopter. The instructor will always be using one of the front seats, and you will be taking turns to sit in the front and work out how to fly it, or sitting in the back and watch somebody else! (While you try and work out where you are). Each voucher entitles one person to participate in this experience. The voucher is non-transferable, which means that only the person named on the voucher can use it. The voucher remains valid for bookings for 9 months from the date of purchase. Please contact the operator	using the details printed on your voucher to arrange a date for your event. Cumbernauld, GLASGOW, Lanarkshire, G68 0HH. The voucher will have Cumbernauld printed on it, but it can be used from..